The statement signed by the undergraduate student body president at Ohio State University and his counterparts at more than 120 schools in 34 states and Washington, D.C., stretching from California to Florida and New Jersey. It expresses support for University of Virginia students in Charlottesville, where a driver is accused of slamming into a crowd of people protesting a white nationalist rally. One woman died. Protesters in North Carolina have toppled a long-standing statue of a Confederate soldier. Activists on Monday evening used a rope to pull down the monument outside a Durham courthouse. Video footage posted online shows protesters — some white, some black — kicking the crumpled bronze statue as dozens of people in the crowd cheered and chanted. A United Daughters of the Confederacy website says the Confederate Soldiers Monument was erected in 1924. Several hundred people are marching through the streets of an Ohio city where the man accused of running down protesters in Virginia had been living. The anti-white supremacists rally Monday in Maumee (maw-MEE) is happening just a few miles from where James Alex Fields Jr. lived the past year. Fields is in jail in Virginia, where he’s accused of ramming his car into counterprotesters at a white nationalist rally Saturday, killing one person and injuring 19. At the Monday march in Ohio, Chris Thomas of Sylvania says residents need to stand up and say that Fields doesn’t represent their community. She says we need to stand up and say we’re all Americans and that the nation was built on diversity. A Texas lawmaker says Texas A&M University won’t host a “white lives matter” rally on the campus next month. Republican state Rep. John Raney said Monday that university chancellor John Sharp told him the event had been canceled due to “hate messages” on social media and police concerns of violence. The event had been scheduled for Sept. 11. Raney made the announcement on the floor of the Texas House of Representatives just hours after lawmakers said they were working to stop the rally from taking place. Texas A&M officials confirmed the event had been canceled. The event was organized by a former A&M student who said he was inspired by a white nationalist rally in Charlottesville, Virginia, on Saturday. That event erupted in violence as protesters and counter protesters clashed. Police say a 20-year-old man rammed in his car into a group of the counter protesters, killing a woman and injuring at least 19. A former teacher of the man says he idolized Adolf Hitler and was fascinated with Nazism. Virginia Gov. Terry McAuliffe is directing his administration to conduct an “extensive review” of how police prepare and respond to rallies like the one that ended with deadly violence in Charlottesville. The Democratic governor has adamantly supported how police handled Saturday’s protests. His office said Monday in a statement that he wants his administration to review how permits for such rallies are granted. McAuliffe also said he had directed his administration to form a commission focused on racial reconciliation. The governor said he wants “actionable recommendations” on what the state can do to promote unity and public safety. The driver charged with killing a woman at a white nationalist rally in Charlottesville worked as a security officer in Ohio. Securitas Security Services USA, Inc. said in a statement on Monday that James Alex Fields Jr. worked for the company for two months starting in May 2016 and again from November to the present. Securitas says Fields was on previously requested vacation leave when police say he rammed his car into a crowd of counter-protesters on Saturday, killing 32-year-old Heather Heyer. The company says Fields’ employment has been terminated. Fields has been charged with second-degree murder and other offenses. Accident investigators say there was no distress signal from a Virginia state police helicopter that crashed over the weekend near Charlottesville, where neo-Nazi and so-called alt-right demonstrators clashed with counter-protesters. The National Transportation Safety Board said Monday that the helicopter was providing video to police of activities in downtown Charlottesville before it broke off to lend support to a motorcade for Virginia Gov. Terry McAuliffe. Within two minutes there was a 911 call reporting the crash, which happened 7 miles (10 kilometers) southwest of the Charlottesville airport. Both state troopers on board were killed. The board said the helicopter’s vertical flight path was about 45 degrees when it descended into trees. The tail boom separated from the main wreckage and became lodged in a tree. The Richmond-Times Dispatch reports that a National Transportation Safety Board report says the helicopter sustained “substantial damage” in a 2010 rough landing after losing power. The mother of a University of Virginia student injured when a car rammed through counter-protesters at a white nationalist rally says she hopes her daughter can be returned to Houston for medical treatment and recovery. Ericka Chaves said Monday that her 20-year-old daughter, Natalie Romero, suffered a skull fracture and other injuries on Saturday in Charlottesville, which is home to the university. Chaves says it’s “really hard” for her daughter to talk, but she’s tough. Chaves says she hopes her daughter doesn’t return to the university after she heals. Romero is attending the school on a scholarship. She was a leader at Houston’s Bellaire High School’s Junior ROTC program and was named outstanding ROTC cadet in 2016. Charlottesville Police Chief Al Thomas told a news conference Monday that a hotline was being set up to enable people to report assaults and other criminal activity that may have occurred at a weekend rally of white nationalists. He also said “alt-right” rally attendees had failed to follow an agreed-upon plan on entering Emancipation Park. The attendees were gathering to protest plans to remove a Confederate statue. The event also drew counter-protesters - and Thomas said the crowds became more aggressive and “mutually engaged combatants” became more violent. He was referring to 32-year-old Heather Heyer, who died after a car police say was driven by James Alex Fields Jr. rammed into a crowd of counter-protesters. Two Virginia State Police officers also died when their helicopter, which was dispatched to the area, crashed just outside of Charlottesville. Google says it’s canceling the registration of neo-Nazi website The Daily Stormer for violating its terms of service, after it posted an article mocking the woman who was run over and killed at a white nationalist rally in Virginia. The site was briefly down Monday — following a move by registration company GoDaddy to also cancel the site’s domain name. But after a short time it was back up, including a post from the website’s publisher, Andrew Anglin, saying he had retaken control of the site. The site claimed it was briefly controlled by a member of the “Anonymous” group of hackers. The article about Heather Heyer criticizes her appearance, that she had no children, and that she couldn’t move fast enough to avoid the charging car. 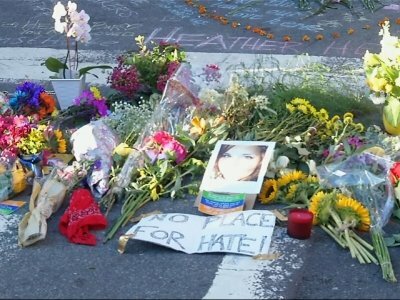 The 32-year-old Heyer died after a car police say was driven by James Alex Fields Jr. rammed into a crowd of counter-protesters. The group was demonstrating against white nationalists who had gathered to oppose the removal of a statue of Confederate Gen. Robert E. Lee from a park in Charlottesville. A spokeswoman for a hospital in Virginia says 10 patients treated there after a car ran into counter-protesters at a white nationalist rally have been released. Nine others are in good condition. UVA Health System spokeswoman Angela Taylor gave the update Monday. Twenty people were taken to UVA Medical Center after the car ran into the crowd Saturday in Charlottesville, Virginia. One, Heather Heyer, died. Five were initially in critical condition. The hospital has said it treated additional patients related to Saturday’s events beyond those 20, but that it can’t give an exact number. Keegan McGrath told The Associated Press on Monday that he was roommates with James Alex Fields Jr. on that trip in 2015. McGrath says he challenged Fields on his beliefs and went home early because he couldn’t handle being in a room with Fields. He says Fields seemed fairly normal before that at their school in Union, Kentucky. Fields is charged with second-degree murder after authorities say he drove into a crowd in Charlottesville, Virginia, on Saturday, fatally injuring one woman and hurting 19 others. A judge said Monday he’ll appoint an attorney to represent Fields. A group that hosts a ceremony every year to re-dedicate an Atlanta monument depicting a Confederate soldier vows that it will be repaired after protesters spray-painted it and broke a chunk from it. John Green, past commandant of the Old Guard of the Gate City Guard, said Monday it appears his group must now raise money to repair the 105-year-old statue damaged during a Sunday protest after the deadly weekend violence in Virginia. City officials haven’t commented on any plans for repairs or whether city funds would be used for that. Green said removing the statue from Piedmont Park, a city park, is not an option. He said the angel standing over the soldier represents peace, and it was created to help bring the nation back together after the Civil War. GoDaddy tweeted late Sunday night that it has given the Daily Stormer 24 hours to move its domain to another provider because the site has violated GoDaddy’s terms of service. GoDaddy spokesman Dan Race tells the New York Daily News that the Daily Stormer violated its terms of service by labeling a woman killed in an attack at the event in Charlottesville “fat” and “childless.” Heather Heyer was killed Saturday when police say a man plowed his car into a group of demonstrators protesting the white nationalist rally. Protesters spray-painted and broke a chunk off a statue depicting a Confederate soldier at an Atlanta park after they marched through the city to protest the weekend violence in Charlottesville, Virginia. The Atlanta Journal-Constitution reports that a lone policeman at Piedmont Park on Sunday night was surrounded by black-clad protesters shouting “pig” as demonstrators used chains to try and destroy the Peace Monument. The statue depicts a winged angel standing over a Confederate soldier. Video from local news outlets showed red spray paint covering much of the monument following the demonstration. The Atlanta protest was among several around the nation over the weekend that were organized after a chaotic white supremacist rally in Virginia ended with deadly violence. The German government is condemning the white nationalist rally in Virginia that turned violent Saturday, expressing solidarity with peaceful counter-protesters. Seibert says Merkel also regrets the death of a counter-protester and sent her sympathies to those injured. An Ohio man accused of plowing his car into counter-protesters at a white nationalist rally in Virginia is set to make his first court appearance. Col. Martin Kumer, superintendent at the Albemarle-Charlottesville Regional Jail, says 20-year-old James Alex Fields Jr. has a bond hearing Monday morning. Fields has been in custody since Saturday. Jail officials told The Associated Press they don’t know if he’s obtained an attorney.